I enjoy living in this complex.submitted by Sergio M. - Jul 01, 2012 |Recommended: YesIt's well kept, clean and convenient to downtown Dallas. I also like the mixture of tenants ranging from families to young professionals. And the staff is always friendly. Great place so far!! !submitted by Ricardo S. - Jun 07, 2012 |Recommended: YesIt is a nice place to live at. Good customer service, landscaping and surroundings well taking care of. Very Pleased!!! !submitted by Glenn C. - Dec 06, 2011 |Recommended: NoI really enjoy it. The grounds are beautiful and the leasing office is very accomodating and helpful. So far it has been wonderful! submitted by Kathleen C. - Oct 31, 2011 |Recommended: YesFantastic! Quiet on my side of the building. Parking is never an issue. Seems to be really safe so far. Nice with great management staff.submitted by Colton G. - Oct 02, 2011 |Recommended: YesI enjoy my apartment very much. It's is the perfect size for me and what I need to use it for. I do have a few things I dislike. I did not enjoy the construction of the new apartments next door, and the fact that they now block my view of Downtown Dallas. Now that I have absoultly nothing to look at I would much rather be on the inner court yard side of the building. I also hear the couple upstairs from me very often, especially when they have been out drinking all night. The last thing is the new spray on counter tops. You can use them for nothing! You can not right on them and defiently can't rest your arms on them to do any type of work, it feels like sand paper and I'm sure it was cheap. Besides that I do really enjoy the staff here. They are all very friendly and very helpful and will always give you a big smile! I have been very happy living at 5225.submitted by Laurie P. - Sep 01, 2011 |Recommended: YesEveryone is friendly, I feel safe there, staff is nice....would recommend. Great place to livesubmitted by Joy K. - Sep 01, 2011 |Recommended: YesSafe, nicely maintained, plenty of parking, nice landscaping. Convenient location, well-maintained, reasonably priced, and spacioussubmitted by Lacy R. - Aug 02, 2011 |Recommended: YesIt's a good value and it is conveniently located. 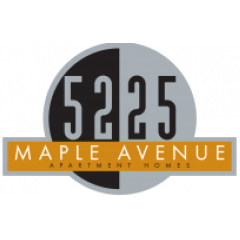 I am generally pleased with community, except fo frequent access gate problems.submitted by Johnny C. - Aug 02, 2011 |Recommended: Yes5225 Maple is a great place to live with friendly neighbors and a responsive management team. I have known Angela- Property Manager- for almost 6 years now. We love it! The community here is awesomesubmitted by Andrew Y. - Aug 02, 2011 |Recommended: YesThe staff is very professional, the community friendly and the facilities are well maintained. Highly recommend! Great place to livesubmitted by Joy K. - Jul 01, 2011 |Recommended: YesIt's great, especially now that Angela is the manager. Maintenance seems much better, the repainting of the exterior has made the place look even better, and I've just signed up for a third year. Conveinent location & responsive management team submitted by Anonymous - Jun 02, 2011 |Recommended: YesGrounds are kept up and maintenance requests are completed in a timely fashion overall the apartments are nice. Other then a few occasional pet owners that do not pick up after their dogs or keep them on leashes no major issues. I like the apartment but having to get accustome to the noisessubmitted by Hal B. - May 27, 2011 |Recommended: YesNice apartment complex in a area that is going many changes. The management team is great to work with.